Background International sports bodies should protect the health of their athletes, and injury surveillance is an important pre-requisite for injury prevention. The Fédération International de Football Association (FIFA) has systematically surveyed all football injuries in their tournaments since 1998. Aims Analysis of the incidence, characteristics and changes of football injury during international top-level tournaments 1998–2012. Methods All newly incurred football injuries during the FIFA tournaments and the Olympic Games were reported by the team physicians on a standardised injury report form after each match. The average response rate was 92%. Results A total of 3944 injuries were reported from 1546 matches, equivalent to 2.6 injuries per match. The majority of injuries (80%) was caused by contact with another player, compared with 47% of contact injuries by foul play. The most frequently injured body parts were the ankle (19%), lower leg (16%) and head/neck (15%). Contusions (55%) were the most common type of injury, followed by sprains (17%) and strains (10%). On average, 1.1 injuries per match were expected to result in absence from a match or training. The incidence of time-loss injuries was highest in the FIFA World Cups and lowest in the FIFA U17 Women's World Cups. The injury rates in the various types of FIFA World Cups had different trends over the past 14 years. Conclusions Changes in the incidence of injuries in top-level tournaments might be influenced by the playing style, refereeing, extent and intensity of match play. Strict application of the Laws of the Games is an important means of injury prevention. The Fédération International de Football Association (FIFA) started to systematically document all injuries of players in the 1998 FIFA World Cup.1 Football injuries in 51 FIFA tournaments (see table 1) and in four Olympic Games have been surveyed until 2012. Other sport federations (eg, International Handball Federation (IHF), International Association of Athletics Federations (IAAF), Fédération Internationale de Natation (FINA), International Rugby Board (IRB), Fédération Internationale de Volleyball (FIVB)),2–15 football confederations (Union of European Football Associations (UEFA), Asian Football Confederation (AFC)),16–18 and the International Olympic Committee (IOC)7 ,11 ,12 followed FIFA's model; however, no report on such a number of tournaments or over a period of 14 years has been published previously. Injury surveillance should be the first step in injury prevention.19 Furthermore, long-term injury surveillance enables changes to be monitored over time, and in relating them to the development of the game, modifications in playing style, rule changes or introduction of new equipment or playing surfaces. The aim of this study was to summarise the frequency, characteristics and circumstances of football injury during the FIFA tournaments and the Olympic Games from 1998 to 2012, and to analyse trends in injury incidence in different types of tournaments during this period. All the FIFA World Cups, the FIFA Confederations Cups, and the football tournaments of the Olympic Games from 1998 to 2012 were included in the present study (see table 1). The FIFA Futsal World Cups and the Beach Soccer World Cups were excluded because of the different setting and rules of these games. The incidence of injury was expressed as the number of injuries per match and the number of injuries per 1000 player-hours. The total player exposure hours were computed as: 11 players per team×1.5 h×number of returned team injury report forms.1 ,25 And 95% CI for incidence rates was calculated as the incidence±1.96 times the incidence divided by the square root of the number of injuries. Data were processed using Excel and SPSS. Statistical methods applied were frequencies, cross-tabulations and χ2 tests. Significance was accepted at the 5% level. A total of 1681 matches were played in the 53 tournaments, equivalent to 55 473 player-hours. The team physicians completed and returned 3091 injury report forms, covering 51 001.5 player-hours, to the FIFA Medical Officers. The average response rate was 92% (table 2). A total of 3944 injuries were reported from 1546 matches, which is equivalent to an incidence of 77.3 injuries per 1000 player-hours (95% CI 74.9 to 79.7) or 2.6 injuries per match (95% CI 2.5 to 2.7). The injury rate varied between 1.9 (FIFA Women's World Cups) and 3 (FIFA U20 World Cups) injuries per match in the different types of tournaments. The incidence was lower in tournaments for female players compared with the respective tournaments for male players, except for the Olympic Games. Most injuries affected the lower extremity (n=2706, 70%), followed by injuries to the head and neck (n=577, 15%), trunk (n=302, 8%) and upper extremity (n=269, 7%). In almost all types of tournaments, the ankle (n=718, 19%), lower leg (n=615, 16%) and head/neck were the predominantly injured body parts. Head/neck injuries were significantly more frequent in female than in male players (17% vs 14% of injuries; χ2=9.3, p<0.002). Most injuries were diagnosed as contusions (n=2090, 55%), sprains (n=580, 15%) and strains/muscle fibre ruptures (n=379, 10%). 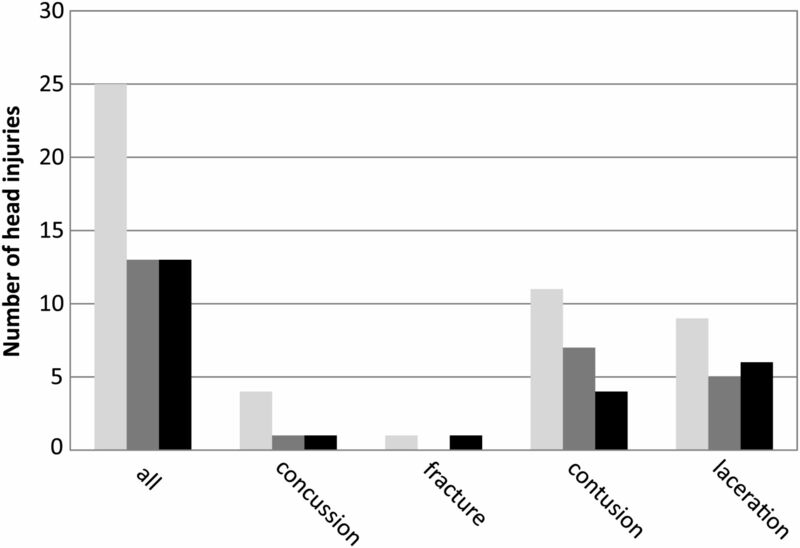 In total, 81 injuries were diagnosed as concussion, 59 as ligament rupture and 63 as fracture (table 3). Female players incurred significantly more concussions than their male counterparts (χ2=6.9, p<0.009). In Club World Cups, the percentage of contusions was lower and the percentages of fractures, ligament ruptures and strains were higher than in other tournaments for male players. This corresponds to the observation that more injuries in Club World Cups resulted in (a longer) absence from football (see below). Most injuries were sustained during contact with another player, while 20% of all injuries were due to non-contact activities (722 of 3544). Almost half (47%) of the contact injuries (1183 of 2501) were caused by foul play based on the judgement of the team physician. In tournaments of female players, significantly less contact injuries were caused by foul play compared with the respective tournament of male players, except for the FIFA U19/U20 World Cups. In Club World Cups, injuries were more frequently incurred without contact (42% vs 18%; χ2=36.9, p<0.0001) than in other tournaments for male players. Information in relation to time-loss from sport, after injury, was available for 3307 (84%) injuries in 1424 matches, since duration of time-loss was not documented in four tournaments (table 2). Almost half of the injuries (n=1540, 47%) were expected to prevent the player from participating in a match or training. The incidence of time-loss injuries was highest (1.5 per match) in the FIFA World Cups and lowest (0.7 per match) in the FIFA U17 Women's World Cups. The average incidence was 32.8 time-loss injuries per 1000 player-hours (95% CI 31.1 to 34.5) or 1.1 per match (95% CI 1.0 to 1.2). The incidence of time-loss injuries was similar in male and female players when the same types of tournaments were compared, except for the FIFA World Cup where the injury rate was significantly lower in female players. A total of 1225 (37%) injuries were expected to prevent players from participating in a match or training for up to 1 week, a further 152 (5%) for 8–28 days, and 61 (2%) for more than 29 days. The expected duration of absence was not specified for 102 injuries. Injuries seemed to be more severe in the FIFA World Cups and the Club World Cups, and less severe in the FIFA U17 Women's World Cups than in other tournaments. On average, 1–1.5 severe injuries per tournament were reported, except for the FIFA World Cups with three per tournament and for the FIFA Confederations Cups with one severe injury in five tournaments. The trend of the injury incidence over time in different tournaments of male and female players is shown in figures 1 and 2. For male players (figure 1), the average number of injuries per match decreased in the FIFA World Cups (1998: 2.40, 95% CI 2.01 to 2.79; 2010: 2.02, 95% CI 1.67 to 2.37) and in the football tournaments of the Olympic Games (2000: 3.74, 95% CI 3.06 to 4.42; 2012: 1.80, 95% CI 1.40 to 2.20) from 1998 to 2012. For female players (figure 2), the contrary trend was observed in the FIFA Women’s World Cups 1999 (1.28; 95% CI 0.83 to 1.77) to 2007 (2.34; 95% CI 1.81 to 2.87) and the Olympic Games 2000 (2.13; 95% CI 1.39 to 2.87) to 2008 (2.88; 95% CI 2.20 to 3.56). An analysis of the World Cup data with regard to the injury mechanism (figure 3) shows that these changes were mainly due to changes in the frequency of contact injuries while the incidence of non-contact injuries remained constant. For the incidence of time-loss injuries, similar trends as described above were observed but did not reach statistical significance due to the low number of cases, except for the FIFA U17 Women’s World Cups 2008 (0.53; 95% CI 0.28 to 0.78) to 2012 (0.88; 95% CI 0.55 to 1.21). No obvious trend over time was observed in other types of tournaments. Injuries per match (black bars: all injuries; grey bars: time-loss injuries) in different top-level football tournaments of male players (WC, FIFA World Cup; OG, Olympic Games; U20, FIFA U20 World Cup; U17, FIFA U17 World Cup; CFC, FIFA Confederations Cup; CWC, Club World Cup). Injuries per match (black bars: all injuries; grey bars: time-loss injuries) in different top-level football tournaments of female players (WC, FIFA Women's World Cup; OG, Olympic Games; U19, FIFA U19 Women's World Cup; U20, FIFA U20 Women's World Cup; U17, FIFA U17 Women's World Cup). Injuries per match (dark grey, non-contact; light grey, contact) in the FIFA World Cups for male and female players (WC, FIFA World Cup; WWC, FIFA Women’s World Cup) with regard to injury mechanism. The average incidence of time-loss injuries (32.8 per 1000 player-hours, range 21.5–36.1) was within the range reported from the European championships16 ,17 and substantially higher than in the Asian tournaments.18 However, while in the FIFA World Cups and the Olympic Games only one to two severe injuries per tournament were reported, the number was twelve in EURO 2004,17 three in WOCO 2005,17 13 in EURO 2008,16 five in the U21 EURO 200616 and four in the U19 EURO 2007.16 The discrepancy might be caused by different data collection procedures. While in the FIFA injury surveillance system an estimate of the duration of absence due to injury should be reported by the team physicians immediately after the match,1 in the UEFA system (which includes time-loss injury only) all injuries were followed until the final day of rehabilitation even if this was after the tournament.16 ,27 Thus, it is possible that the rate of severe injury was underestimated in the present study. However, the incidence of fractures and concussions was higher in the present study than in the UEFA Championships 2006 to 2008.16 The severity of head injuries is not always obvious; therefore, a careful examination of players with a trauma to the head is highly recommended, and diagnosis and treatment should follow the recently published guidelines.28 The number of ligament ruptures could not be compared owing to the different categories for the type of injury in the FIFA and the UEFA injury surveillance systems. The incidence of time-loss injuries was highest in the FIFA World Cups and lowest in the FIFA U17 Women’s World Cups. The injury rates of male and female players were similar when the same types of tournaments were compared, except for the FIFA World Cups. In the FIFA World Cups, the incidence of injuries was significantly lower in female than in male players, as also reported previously for other tournaments.1 ,16 ,22 A decrease in the incidence of injuries was observed in the men’s World Cups and Olympic Games during the period 1998–2012, and an opposite trend was seen in the respective women’s tournaments (see figures 1 and 2). For the World Cups, it could be shown that the contrary trends for men and women were due to the changes in the number of contact injuries. One explanation for the decrease in contact injuries of male players is stricter refereeing. An impressive feature seen was the reduction in the number of head injuries by half after the International Football Association Board gave referees the authority to severely sanction what were felt to be injurious fouls such as intentional elbows to the head.21 This effect was reported for the 2006 FIFA World Cup, which remained stable also in the subsequent World Cups (figure 4). 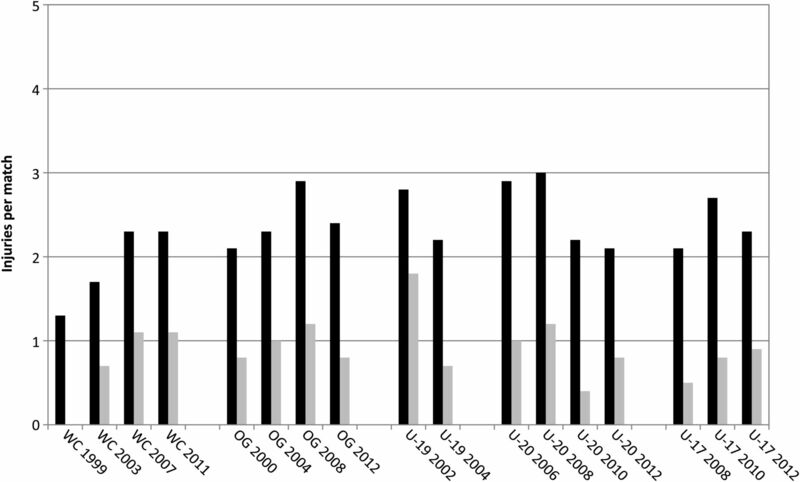 In women’s tournaments, the playing style seems to have become more physical, as indicated by the increase in contact injuries, at least in the FIFA Women’s World Cups (figure 3), and the refereeing less strict as can be concluded from the decrease in the issue of yellow cards from 2004 to 2010 (figure 5). 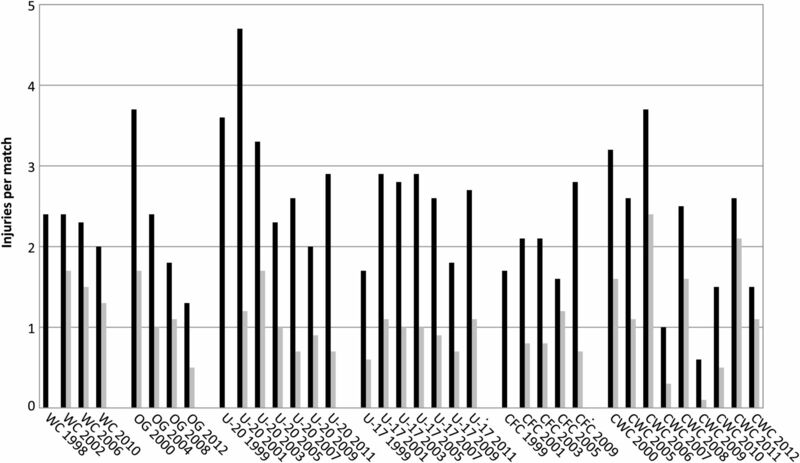 Number of head injuries in the Fédération Internationale de Football Association (FIFA) World Cups 2002 (black bars), 2006 (dark grey bars) and 2010 (light grey bars). Average number of yellow cards per match for female football players in the Fédération Internationale de Football Association (FIFA) tournament and the Olympic Games (data from http://www.FIFA.com). The injury rates in the various types of FIFA World Cups had different trends over the past 14 years. These changes might have been influenced by the playing style, refereeing, extent and intensity of match play. Strict application of the Laws of the Games is an important means of injury prevention. More detailed studies (eg, on injury mechanism, refereeing in injury situations or the number of matches played) are needed to make specific recommendations for injury prevention in top-level tournaments. On average, the incidence of time-loss injuries was highest in the FIFA World Cups and lowest in the FIFA U17 Women’s World Cups. The incidence of time-loss injuries was similar in male and female players when the same types of tournaments were compared, except for the FIFA World Cup. The incidence of injuries in male players decreased in the FIFA World Cups and in the football tournaments of the Olympic Games from 1998 to 2012. The opposite trend was observed for female players in the FIFA Women’s World Cups 1999 to 2007, the football tournaments of the Olympic Games 2000 to 2008, and the FIFA U17 Women’s World Cups 2008 to 2012. Changes in the injury rates might have been influenced by the playing style and refereeing. Strict application of the Laws of the Games and Fair Play are important aspects of injury prevention in top-level international football tournaments. Referees should be educated on their influence on injury rates. Decreasing the number of matches played, especially for the FIFA World Cup and the FIFA Club World Cup players, might contribute to a reduction in injury rates. More research is needed on risk factors for non-contact injuries, especially in the FIFA World Cup and the FIFA Club World Cup players. The authors highly appreciate the cooperation of the members of the FIFA Medical Committee (Chairman: Dr Michel D´Hooghe) and all team physicians who volunteered their time to collect data for this project. We thank Richard Charles, Sonja Schlumpf, Anja König, Monika Keller and Dr Katharina Grimm for their assistance with data collection, and Dave O’Riordan for his assistance with data entry. The authors gratefully acknowledge the Fédération Internationale de Football Association (FIFA) for the funding of this study.
. Rugby World Cup 2003 injury surveillance project. Br J Sports Med 2005;39:812–17.
. Rugby World Cup 2011: International Rugby Board Injury Surveillance Study. Br J Sports Med 2012. Published Online First: 9 June 2012 bjsports-2012-091155.
. Incidence of injuries in the New Zealand national rugby league sevens tournament. J Sci Med Sport 2006;9:110–18.
. UEFA injury study—an injury audit of European Championships 2006 to 2008. Br J Sports Med 2009;43:483–9.
. Football injuries at Asian tournaments. Am J Sports Med 2004;32(1 Suppl):36S–42S.
. 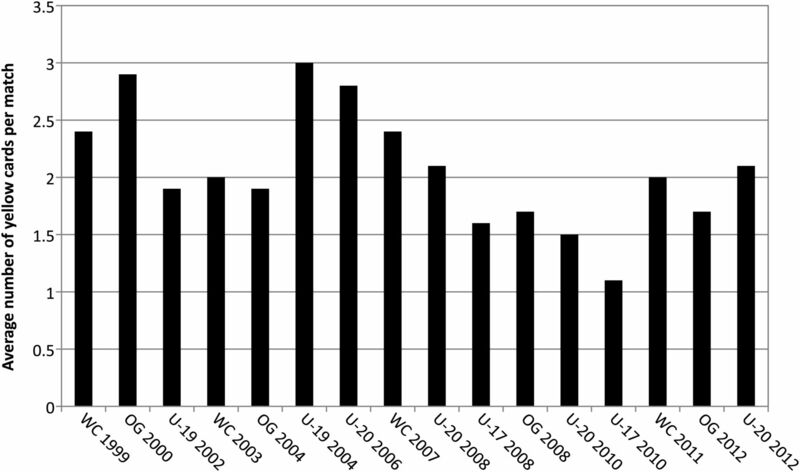 Injury risk of playing football in Futsal World Cups. Br J Sports Med 2010;44:1089–92.
. Football calendar and the wellbeing of players: correlation between match exposure of European footballers before the World Cup 2002 and their injuries and performances during that World Cup. Br J Sport Med 2004;38:493–7. Contributors JD and AJ developed the study conception, design and methods. JD coordinated to data collection. AJ conducted the data analyses and wrote the manuscript. JD reviewed the manuscript and approved the final draft of the manuscript. Funding The study was fully funded by the Fédération Internationale de Football Association (FIFA). Ethics approval University of Zurich, Switzerland.